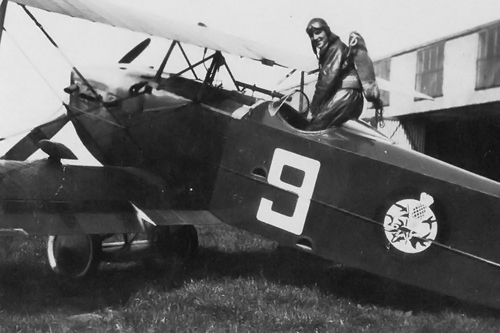 In 1917 a curious flower, at once beautiful and strange, was chosen as emblem for the 1st Fighter Squadron. It was the "Scottish thistle", attracting for its mysterious beauty, but very "stingy" when looking more closely. This emblem, accompanied by its Latin motto "Nemo Me Impune Lacessit" would pass through the years, and remain the proud emblem of the current 1st Squadron of the Belgian Air Force. 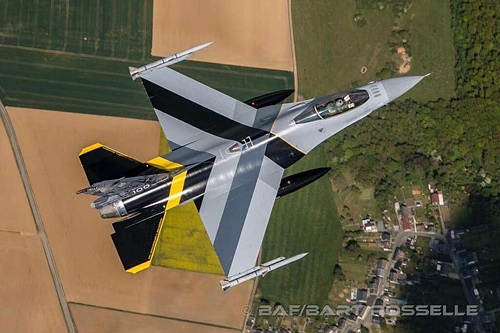 Since 1987, to mark each additional lustrum, the 1st squadron of the Belgian Air Force decorates several aircraft in the dominant tones of its own, the black and yellow. 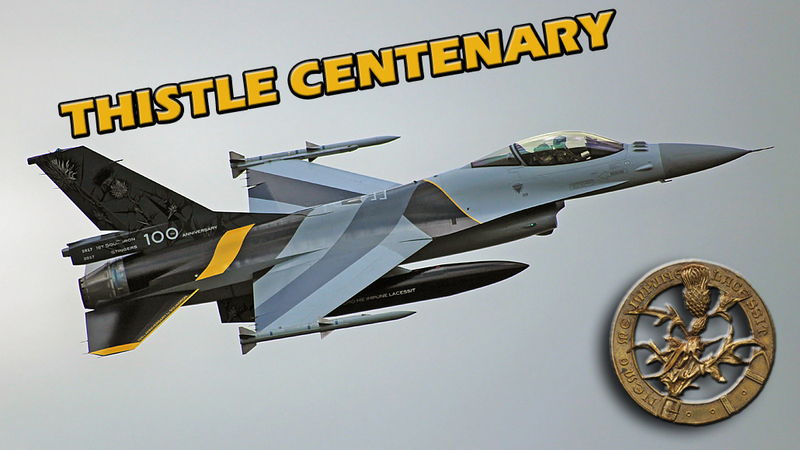 But 2017 is not a year like any other, since this squadron is celebrating its 100th anniversary this time, so a new bird with black and yellow feathers was needed to mark this centenary. To accomplish this new "Blackbird" project, the squadron called on designer Didier Wolff to whom in particular we owe some beautiful decorations of the Mirage 2000 and Rafale of the French Air Force. Once the project was accepted by the General Staff, and executed, the beautiful bird, with the ornate thistle, could take off. The FA 132 was chosen to proudly carry the colors of the squadron on this May 11th. 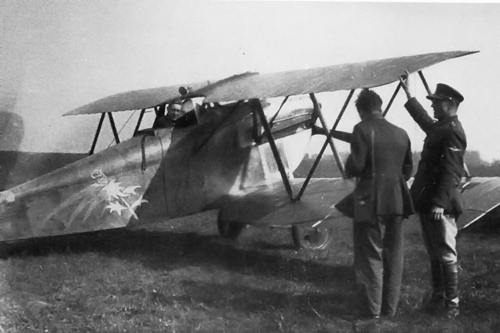 After a first flight, executed by the Commander Officer of the Squadron, the plane returned to the Florennes airbase, where a bunch of journalists awaited the return of the plane, in order to be able to immortalize this historical "roll out". Here are some pictures of the beautiful bird proudly wearing the colors of the centenary, but also a brief historical reminder of the 1st Squadron and its "Scottish thistle" which followed it so faithfully. SBAP would like to warmly thank the entire ComOpsAir IPR team for the invitation and facilities granted during this event. Our thanks also go out to the authorities of Florennes airbase and the members of the 1st squadron for the warm welcome. (Alain Debras ©) You are warned! 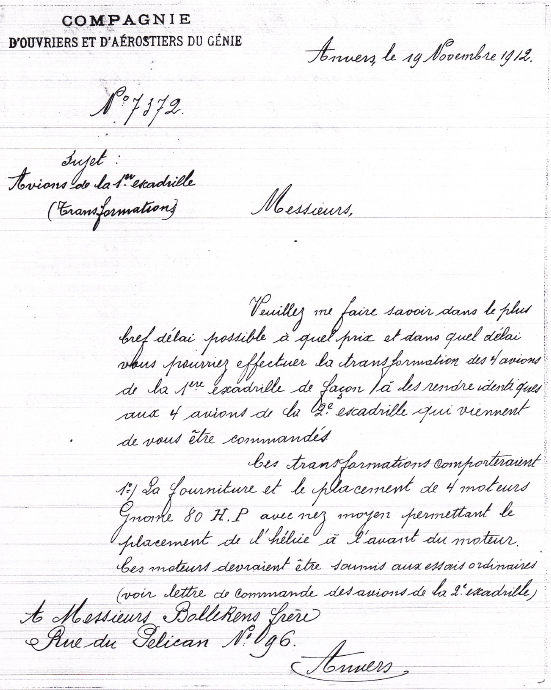 The 1st Squadron was initiated on 1912 (A document is showing a request for modifications on the squadron aircraft). 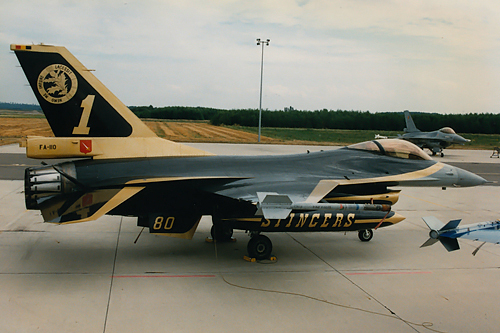 To recognize the 1st squadron aircraft, the tail fin was marked with the code E I. It was then part of the "Compagnie des Aviateurs". 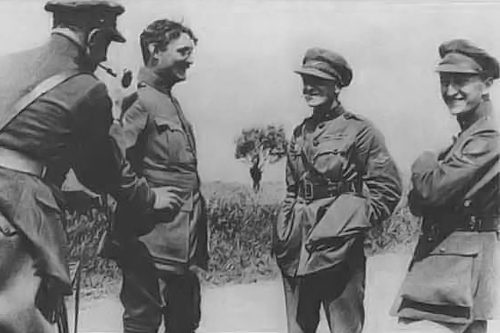 The main mission of the 1st Squadron was observation and artillery support. 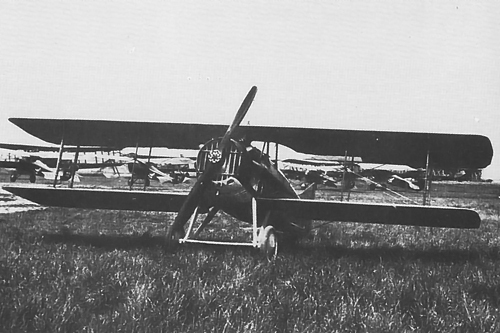 In August 1914, the "Compagnie des Aviateurs had a total of 22 aircraft (Jero-Farman HF.16 and HF.23bis) and 4 of them was affected to the 1st Squadron. At this time the " Compagnie des Aviateurs " was affected to the observation of the front line and the defence of Antwerpen area. At the end of 1914, the front was stabilized and the war became more static in what was called the "trench warfare". The result was that the aviators where dispatched to several airfields in France as well as in the region of Veurne not far away from the Belgian coast. 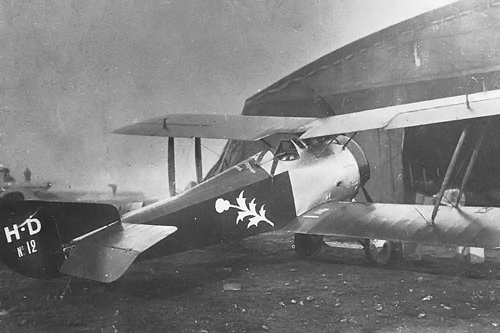 The arrival of new assets from France and the graduation of young pilots helped increase the "Compagnie des Aviateurs" capabilities resulting in the creation of the "Aviation Militaire Belge" (Belgian Military Aviation). At the beginning of this new component, the major role was the reconnaissance, but slowly the role was enlarged to armed flying sorties. At a first time the offensive missions were mostly axed on bombing missions but air defence missions became an evidence shortly after. On the April 17th, 1915, Capt Jacquet and his gunner Vindevoghel, from the 1st Squadron, achieved their 1st aerial victory in a Farman airplane. 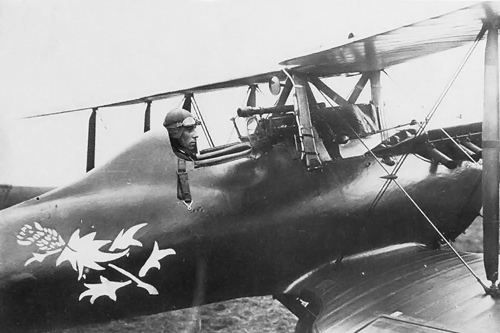 In the middle of 1915, Belgian Military Aviation was reorganized into 6 squadrons, each having a specific role. Two of those, amongst which the 1st Squadron, were designated as fighter squadrons. Initially the squadron was located near the current Koksijde airbase but the squadron moved to "Les Moëres", close to the French border. 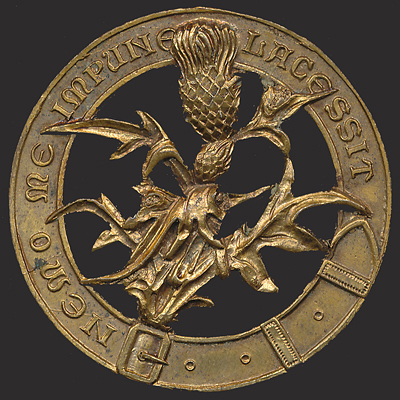 On February 22nd, 1916, the name of 1st Fighter Squadron was officialized and in 1917, under the idea and proposition of André de Meulemeester, the Scottish Thistle became the symbol of the 1st Squadron. A motto was also chosen and came from Latin language: "Nemo me impune lacessit" (no one provokes me with impunity). 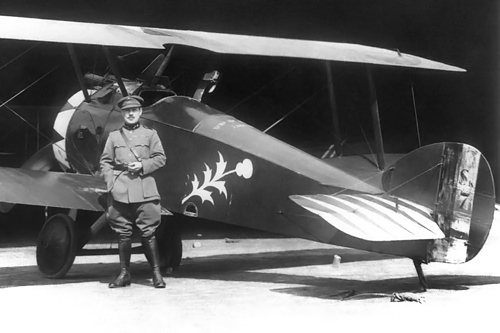 3 years long during the Great War, the squadron flew different kind of aircraft like the Hanriot Dupont HD1 and Sopwith Camel with a final scoring of 51 air victories. 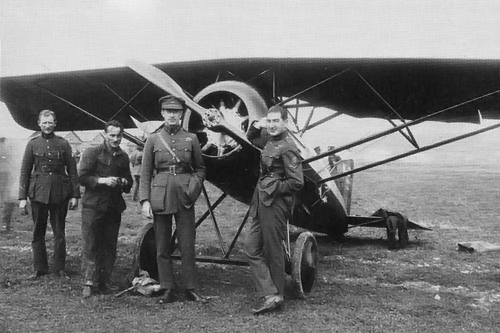 Four of those pilots become aces : Willy Coppens de Houthulst, André de Meulemeester, Fernand Jacquet and Jan Olieslagers. In March 1918, the squadron was renumbered as 9th Squadron under the "Groupe de Chasse Jacquet" (Fighting Wing Jacquet). This wing was able to launch about 40 airplanes in the air on short notice, an exceptional feat at the time. 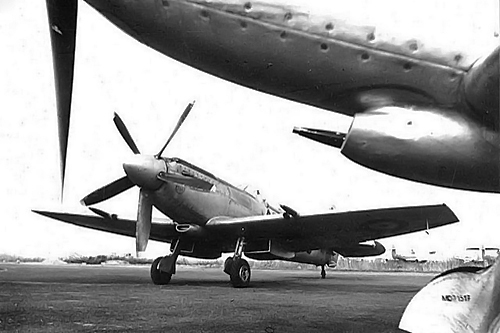 In between the First and Second World War, some squadrons were disbanded, but the 1st Squadron remained and moved with some other fighter squadrons to Evere. Unfortunately, the 1st Squadron fleet became obsolete and remained so until the 1930's when the squadron received the brand new Fairey Firefly IIM plane. Once more, the squadron was renumbered and became the 2/I/2Aé (2nd Regiment/1st Group/2nd Fighter squadron) moving to Schaffen airfield. In 1938, the squadron received one of the most modern fighter of this time, the Hawker Hurricanes Mk I. 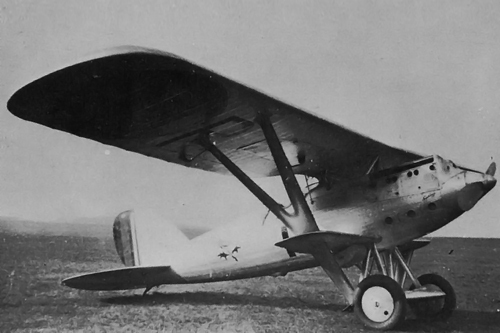 A cutting-edge platform at that time and also the first monoplane fighter of the Air Force. In 1939 with the planetary shadow of a new war, the 1st Squadron was flying some Air Defence sorties, intercepting airplanes that violated the Belgian airspace neutrality. The rules of engagement were very strict, the planes had to box the intruder and signal him visually to follow them. On March 2nd, 1940, a flight of three Hurricanes, lead by Lt Xavier Henrard, were proceeding with an interception on a German Dornier 17 performing a recce mission in the Bastogne area. Following the procedure, the Belgian Hurricanes closed in on the Dornier, but when they attempted to signal the German plane to follow them the bomber opened fire with all its guns and shot down the Hurricane of Lt Henrard. The two others Belgian planes were also damaged but landed safely. Lt Henrard became the first victim of World War II. After this historical fact the interception process was adapted and Belgian fighters damaged many German planes violating our National airspace. On May 10th, 1940 at 3.00 am, the personnel from Schaffen airfield was recalled to be on alert following some reports mentioning German troop movement in the Belgian Ardennes towards the Albert Canal. 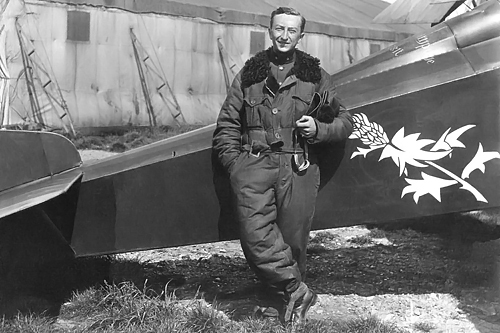 Commanding Officer Charlier was insisting to disperse the Hurricane and Gladiator airplanes to avoid being an easy target for a possible air-to-ground attack. But the Base Commander refused, afraid of possible sabotage acts and the Hurricanes stayed aligned in front of the shelters. At 4.30 am, three Messerschmitt BF-110 performed a strafing attack and destroyed almost all the aircrafts stationed in Schaffen. Only 2 Hurricanes and a few Gladiators survived and were able to take off. 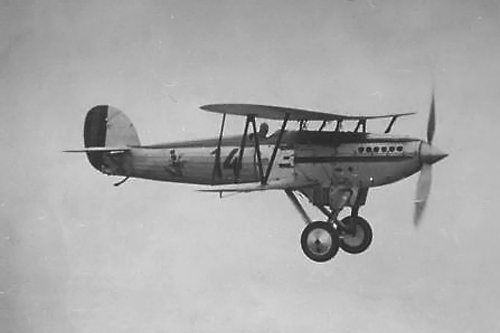 Some enemy bombers were damaged and the Belgian aircraft proceeded to Beauvechain, the dispersal airfield. Sadly the remaining planes were destroyed the next day. At that point, 2/I/2Aé pilots didn't give up and nine of them joined the United Kingdom to continue the war with the Royal Air Force. 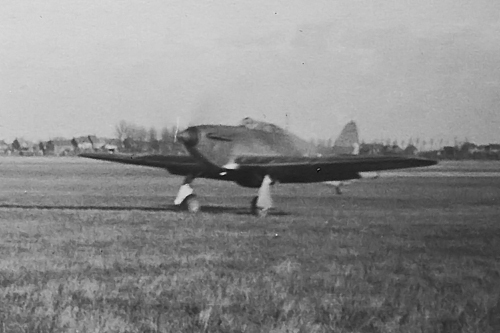 After WWII, the Scottish Thistle of the 1st Squadron reappeared on the Spitfires F.14 and FR.14 from the 351 Squadron of the Florennes based 161 Wing. On February 25th, 1948 the squadron was renamed as 1st Fighter-Bomber Squadron and the Wing was renumbered in 2nd Tactical Wing. Initially, the squadron kept the Spitfire F.14 and got some T-6 Harvard in addition with aircraft code 3R- until 1962. As from June 1951, the 1st Squadron entered the jet age with the delivery of F-84E Thunderjet. The "E" model was rapidly replaced by the "G" model. 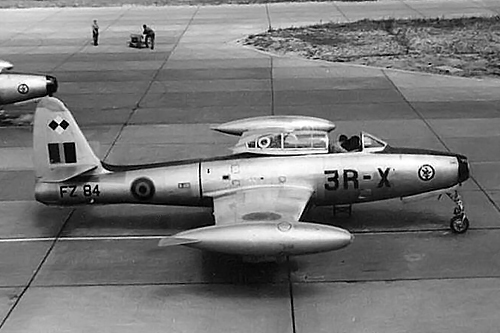 In August 1955 the Thunderjet was replaced by the F-84F Thunderstreak, a modern aircraft with increased capabilities. At this time, Europe was in the instable period called "Cold War" and the mission of the 1st Squadron was to be able to execute tactical strikes on predefined targets in East Germany. The squadron pilots trained regularly in big NATO exercises, gathering more than hundred planes to fulfill the highest training criterias. The year 1971 was marked by the move of the squadron to Bierset airbase near the city of Liège, to be integrated in the 3rd Tactical Wing in preparation of the Dassault Mirage V arrival. 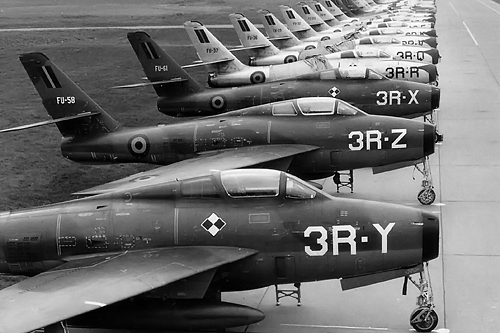 The last squadron Thunderstreaks were sent to Koksijde for storage on May 16th, 1972. At this time with the new Fighter-Bomber aircraft, the squadron was integrated in the AMF (ACE Mobile Force), a quick reaction force under NATO command and the squadron deployed on exercise several times a year as part of that AMF concept. 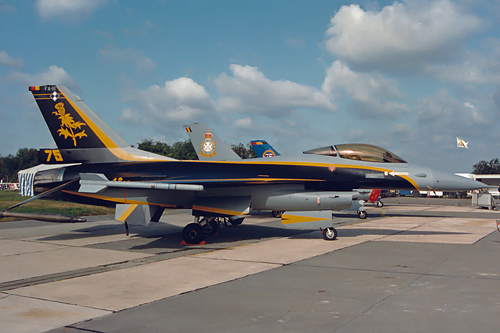 On March 15th, 1989 the squadron flew back to the 2nd Tactical Wing at Florennes and continued shortly to operate the Mirage V aircraft until the last delta aircraft was retired and replaced by the F-16A this year. 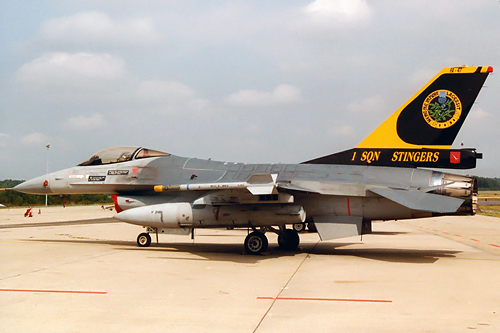 The squadron then converted on Lockheed-Martin F-16A and got a supplementary mission, the reconnaissance replacing the disbanded 42nd squadron. To be able to perform this particular mission, the 1st squadron received some rented Orpheus pods from the KLU, replaced in 1998 by the Modular Recce Pods (MRP), equipped with optical cameras. Later the MRP pod were also replaced by electro-optical and IR sensors. The downfall of soviet block at the end of the 1980's created some tensions between the various Yugoslav communities, triggering an armed conflict between Croatian, Serbian and Bosnian communities. The UN mandates and NATO created a Peace Enforcement Force (IFOR, Implementation Forces) to re-establish the peace in this country. For that purpose the 1st Squadron took part in the mission "Deliberate Guard" from 1997 till 1999. 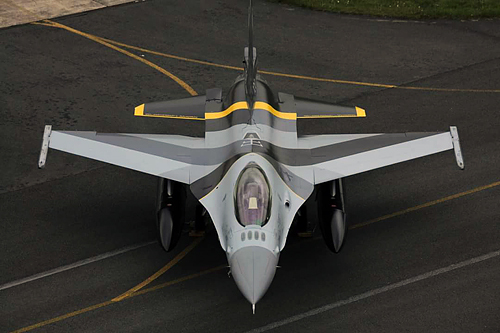 The Belgian squadron worked together with the Dutch Air Force in the Deployable Air Task Force (DATF) concept, initially flying from Villa Franca airbase, and then from Amendola airbase both located in Italy. Regarding the stalemate of conflict, the 1st Squadron trained some pilots from the 2nd and 350th Squadron to be able to make a roll over and carrying Air-to-Ground attacks with the AGM-65G Maverick. End 1998, the troubles in Kosovo rised and international attempts to solve the conflict on a diplomatic way failed. Anticipating a conflict escalation the Belgian detachment in Amendola was reinforced with a total of twelve F-16's. The international community's aim was to end the conflict and the decision was taken to launch an air campaign named "Allied Force". This operation took place from March 23rd, 1998 until June 10th, 1999. 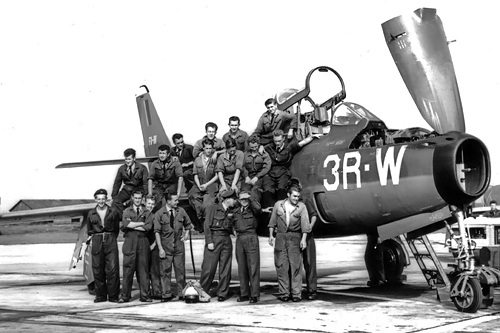 The 1st Squadron pilots performed Air Defence missions up to six hours flight time, as well as air-to-ground attacks. No less than 679 air combat sorties were carried out, totalizing 279 bombs dropped. 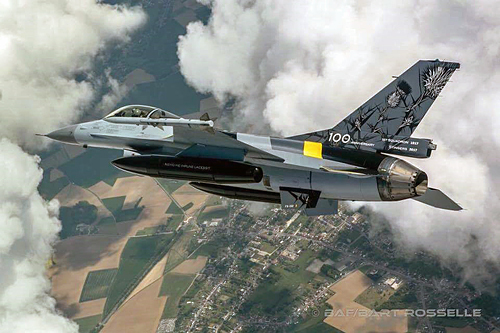 Surveillance flights over Kosovo ended in April 2001 and the four 1st Squadron F-16's left Amendola heading back to Belgium. 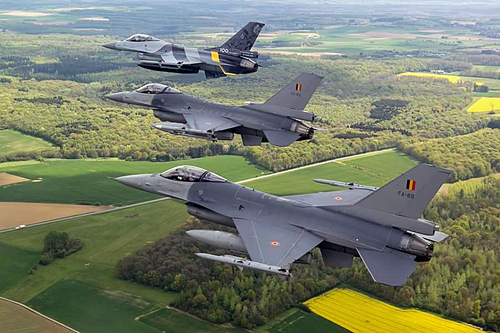 Following these conflict operations, all Belgian F-16's squadrons became multi-role squadrons with the remaining of the recce missions for the "Thistle" squadron. 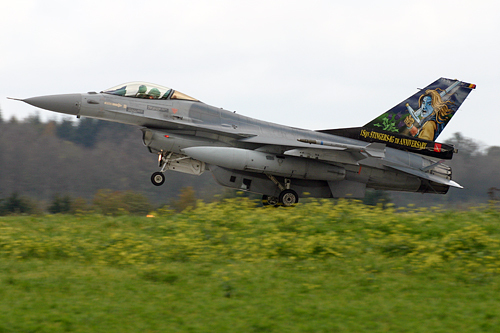 Following 9/11, the Quick Reaction Alert in Florennes was re-activated and two fighters put on a permanent alert status. 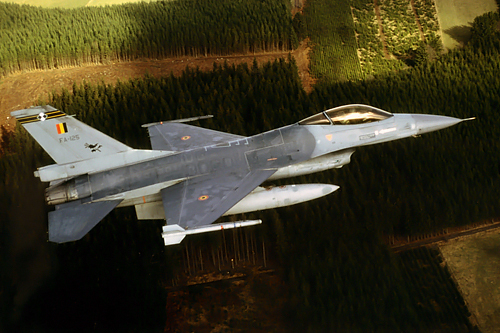 In 2004, following a request from the new Baltic members of NATO, an air policing mission was created. The 1st Squadron was one of the first participants deploying to Lithuania in 2004. In Afghanistan, NATO took over some responsibilities from the Americans and Belgian F-16's were deployed to Kabul in September 2005, to accomplish some recce missions. For the first time, the squadron F-16's were deployed in the heart of a war theater. This mission called "Eastern Eagle" was initially planned for four months. In September 2008 the "Thistle" went back to Afghanistan, in Kandahar this time, for the operation "Guardian Falcon". "Non-Traditional Intelligence Surveillance and Reconnaissance (NTISR)"
"Close Air Support (CAS)" with regular weapon usage. The detachment was composed of pilots from different squadrons and the rotation duration was set to four-months, two-month for the pilots. The operation ended in October 2014 with a total, for the Belgian Air Force, of 16500 flying hours, 5466 combat sorties, 73 laser or GPS guided bombs launched and 28 gun strafing attacks performed. By the end of that operation, the "Arab Spring" escalated into an armed conflict in Lybia. Fearful of bloody retaliation from Kadhafi's regime, NATO decided an intervention as from March 2011. 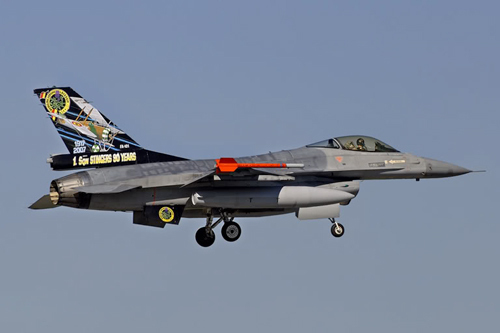 Although six F-16's were already deployed to Afghanistan, six other were deployed to Araxos in Greece to participate in operation "Unified Protector". Once again, the contingent was mixed and almost all the pilots from the 1st Squadron participate to the operation. The operation ended in October 2011 with a total of 2568 flying hours, 614 sorties and 472 bombs dropped. The squadron F-16's were just back from Afghanistan when a new operation started under American command: "Inherent Resolve". This operation's objective was to help the Iraqi regime to face the terrorist group Daesh. 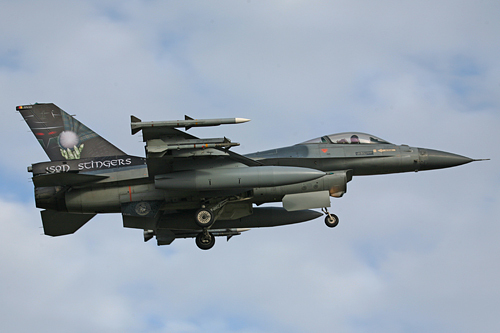 Therefore six F-16's were deployed to Jordan under the Belgian-named operation "Desert Falcon". Several airstrikes were conducted by the "Thistle" pilots during the nine month participation into this operation. The Ukrainian crisis in 2013-2014 and the Russian implication pushed NATO to reinforce its presence in Eastern Europe. 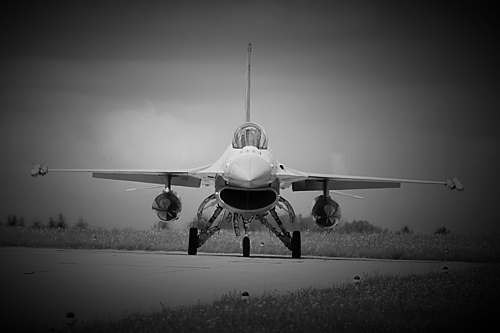 The 1st Squadron took part in the mission "Enhanced Air Policing (EAPM)" from Malbork in Poland involving 4 F-16's while simultaneously deployed in Iraq. 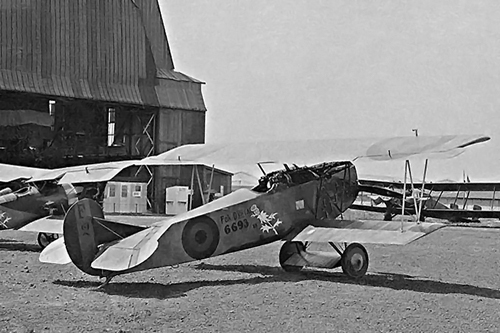 After a century of existence, "Thistle" pilots and personnel also called the Stingers Squadron have always answered the calls when help was needed, be it during World War I (the great one), World War II among Royal Air Force services, the "Cold War" and most recently all the various international crisis. All 1st Squadron members can be proud of their history and don't forget…"Nemo Me Impune Lacessit"… you are warned! Aircraft in use under the "Thistle"